"...Overall, Rutherford's staging (which also features some inventive choreography in the small space from Derek Van Barham) does an admirable job at addressing the shortcomings of the material. It's tricky onstage to move from parody to horror, so Rutherford mostly - and wisely - favors the former. Even if the premise runs out of gas by the end, Black Button Eyes embraces the cheap-and-dumb glory of the original films with gusto and scores some genuine laughs along the way by not always pandering to the lowest of demon denominators." "...The script by George Reinblatt balances catchy musical numbers with hysterical dialogue, well supported by Oliver Townsend's musical direction. The excellent cast makes use of every inch of the intimate stage, in no small part thanks to Derek Van Barham's tight choreography, which adds whimsy and enhances the cheesy nature of the show. The actors are clearly having a great time and, much like the Kandarian Demons in the story, their joy possesses the audience." "...Musical director Oliver Townsend powers an excellent three-piece band through the score and guides the singers to ingratiating performances. Harris is a rock-solid, versatile singer as Ash, well-matched to Gibson's appealing ( if simple-minded ) Linda. Jackson as Cheryl has solid comedy chops and an unexpected big rock voice. Love in two roles ( Shelly and Annie ) not only contributes musically but also plays Annie in droll Eve Arden style. Josh Kemper's Scott is a perfect loudmouth jerk who can sing. Ed Rutherford is the astute director and Derek Van Barham the choreographer. Jeremiah Barr designed sets, props and puppets, and Jon Beal designed the gore." "...As always with a spoof, this show can’t be both scary and satirical — and Ed Rutherford’s staging needs a bit more snap in delivering the one-liners. Oddly, the most hilarious part of the show is unintended: It comes when the theatergoers who sat in the four plastic-shrouded rows of the “splatter zone” — but who didn’t take a hint to put on their protective slickers — howled very sincerely when the copious blood hit their soon-to-be-cleaned clothes. That was a scream." "...As the first winter storm with measurable snowfall blew into Chicago one evening last week, the audience at the Pride Arts Center eagerly settled in for the Chicago storefront premiere of Black Button Eyes Productions riotously entertaining and completely hilarious production of “Evil Dead: The Musical.” While their were plenty of liquids flying through the air on stage, they were neither white in color nor crystallized like the flakes swirling outdoors. This clever parody, a mash-up of sorts of all of the Sam Raimi classic films that inspired it, has an uproariously funny book by George Reinblatt, who also wrote the wacky lyrics. The lively score was composed by Christopher Bond, Frank Cipolla, Melissa Morris and Reinblatt. This would make a great date night for you and your bloody Valentine." "...Presented here by Black Button Eyes Productions and directed by Ed Rutherford, “Evil Dead The Musical” takes advantage of the intimate space at Pride Arts Center by creating a special “splash zone” where patrons are encouraged to wear theater-provided ponchos in order to guard against the fake blood splatter. The production offers a talented cast led by Jordan Dell Harris as the everyman turned zombie hunter. Other standouts include Caitlin Jackson as the wise-cracking kid sister, and the very funny Stevie Love, who plays both an airhead girlfriend and a scientist in search of truth. The score is also perfectly executed by music director Oliver Townsend." "...There's so many reasons to recommend this show that it's difficult to know where to begin. But first, this definitely isn't a musical for everyone. The more conservative audience member who prefers the classics of Theatre's Golden Age may be put off by this show. Besides being a cleverly written satire of a B-level, cult supernatural horror film (which is itself a satire of the genre), the musical is filled with over-the-top characters, raucous rock songs, a plethora of profanity and gallons of guts and gore. Nowhere in sight is there a surrey with the fringe on top." "...Along with Jordan Dell Harris as Ash, the cast is strikingly good: Josh Kemper as the ever randy Scott; Kirby Gibson as Ash's girlfriend Linda (eventually beheaded), Stevie Love in dual roles as Shelly and Annie. For an over-the-top performance Caitlin Jackson gets a shout-out - she is wonderful and it is a performance not to be missed." 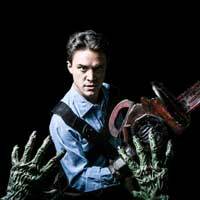 "...Black Button Eyes’ production of Evil Dead: The Musical delivers visceral laughs amid comedically gruesome viscera. Though the music and dialogue can be cornier than a tortilla factory, the cartoony caricature-esque stylization serves to the benefit of the outrageously spontaneous humor of this show; being evil never seemed so fun. The spontaneity and surprise of this musical is well supported through detailed production design, a supercharged band and a (literally) killer cast." "...Evil Dead the Musical is a blood, vulgarity, and fun-filled romp that will appeal to lovers of B horror movies, The Rocky Horror Picture Show, and of course, anyone who enjoys the goofier entries in the Evil Dead franchise, like Evil Dead II and especially Army of Darkness. Black Button Eyes Productions has done a rousing job of bringing Evil Dead the Musical to life at Pride Arts Center, and they didn't even need to rely on Kandarian demons to do it. So, if you're feeling groovy, grab your broomstick (or borrow one if you must) and go see Evil Dead the Musical"
"...Director Ed Rutherford had lots of fun envisioning absurd moments and bringing them to life, and his actors are having so much fun you sort of wish they wouldn't die at all, though you know they will. (That's a weird statement that only makes sense in connection with a horror comedy.) The original five students include Ash, his sister Cheryl (Caitlin Jackson, who has more fun than anyone in the part of the first victim and first demon), his S-Mart colleague and girlfriend Linda (Kirby Gibson), his brother Scott, who is pretty detestable (Josh Kemper), and the girl he picked up for the weekend, Shelly (Stevie Love). As the insanity mounts in the cabin and their escape route is cut off, the five slowly wend toward their fates." "...Black Button Eyes does give Evil Dead it’s due justice, but it does feel like the safe route was taken through only sticking to the text. Why not take everything to the extreme with more blood and more obvious cheesiness? This show isn’t groundbreaking in its themes and form but it can be fun, if you let it. I would recommend this production to anyone who’s a fan of gore, camp, and the Evil Dead Franchise."